If you have ever tried sewing a hem on knits or other stretch fabrics, you will appreciate how fiddly and difficult it can be. Maybe you avoid using those types of fabric for that reason. This is where a coverstitch machine comes in. It can create those tidy hems that we see on T-shirts, Lycra sportswear, swimming suits, fleeces and so much more. The two or three rows on one side of the fabric and the serger-style chain stitch on the back are strong and stretchy. A coverstitch machine can give a professional finish to sleeves, cuffs, necks, hemlines and more. Our guide can help you decide which machine will best suit your needs and budget. There are some useful features which you may want to consider in a coverstitch machine, depending on the type of work you will be doing. Let’s take a look at some of them now. 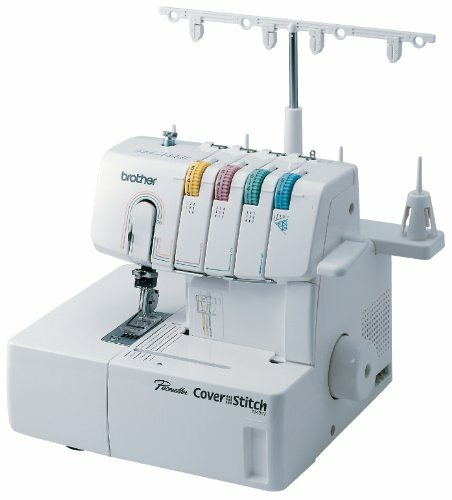 The majority of coverstitch machines have three threads and a looper. This allows you to stitch between one and three straight lines on the visible side of a hem. The underside of the hem will have one or two lines of loops. The more rows and loops, the stronger the hem will be. If you only plan to create double-stitched hems, with two upper threads and one looper, you could get a more cost-effective machine. On the whole, coverstitch machines are similar to a regular sewing machine when it comes to threading. They tend not be as complicated and fiddly as a serger, even though they have more than one thread. More expensive models might offer an automatic, jet-air threading system. This could be useful if your eyesight is not at its best or you have difficulty with fine motor skills. A coverstitch machine will generally offer a mechanism which adjusts the needle thread tension. It is usually controlled by a lever or dial. Some machines might have an automatic-tension control. Some machines also have additional controls to assist when you stitch over seams. These might be thicker, especially on fabrics such as fleece and sweatshirt material. An adjustable stitch width allows you to set how far apart your stitches are. Creating a blind hem or stitching raw edges needs a wider stitch than sewing a straight line. The stitch length will determine how strong your hem is. The shorter the stitch the more durable the end result. A longer length stitch is beneficial for decorative finishes and temporary stitches. In general, a heavier fabric will need longer stitches, usually about 4mm or 0.16 inches. Delicate and finer fabrics are better when a shorter stitch is used, in the region of 2mm or 0.08 inches. Consider how many stitches a minute the machine is capable of completing. The more stitches per minute, the quicker work can be completed. This is particularly useful if you do a lot of sewing. A free arm makes hemming things such as cuffs, sleeves and other cylindrical shapes much easier. It stitches in a circular motion. The pressure of the presser foot on some machines can be adjusted. This moves the foot nearer or further away from the bed of the machine. Having the ability to control this means you can hem all sorts of fabrics, from fine- draped jersey to fleece sweatshirts. It helps prevent wavy hems. A differential feed adjusts the feed dogs ensuring fabrics are not stretched when stitching. This means a perfect hem every time with no puckering or waviness. 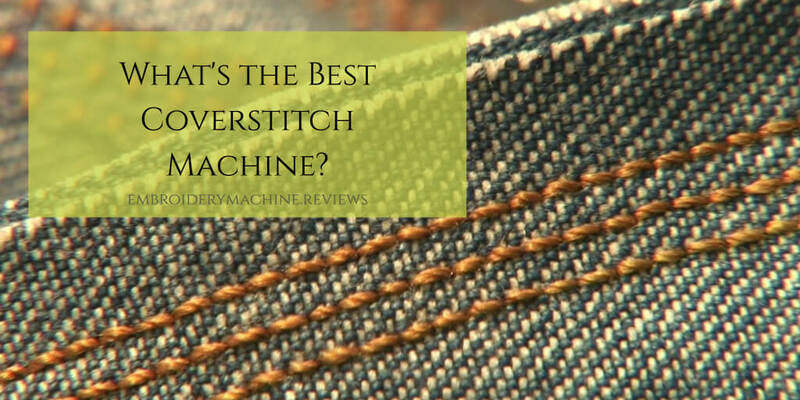 Now that we have detailed some of the features to look out for in a coverstitch machine, let’s take a look at our top picks. Brother has long been associated with affordable sewing machines. This coverstitch machine has the functionality and quality you would expect from this well-known brand. While they call it a serger, it does not have the features or capability to serge hems. This machine offers a great entry-level option for beginners. It can also complete coverstitch tasks expected by more experienced sewing enthusiasts. The machine measures 13 by 15 by 13.4 inches and weighs 16.75 pounds. It can stitch at speeds up to 1,100 stitches per minute, meaning you can work at a quicker pace. 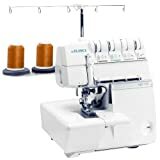 A differential feed ensures that your fabric remains at the correct tension for sewing and it has a quick looper system making it easy to set up your threads. The lay-in system has a threading guide, color-coded for your convenience. Stitch length can be adjusted between 0.07 and 0.15 inches (2-4mm). The stitch width is adjustable between 0.11 and 0.23 inches (3-6mm). There are dials located on the side of the machine controlling these functions. The 2340CV produces professional hems and decorative finishes. Using one needle and two threads creates a decorative, double chain stitch. This is good for tape binding, joining woven fabrics and creating fancy finishes. You could opt for a three-thread, two-needle setup and a narrow stitch for top-stitching or hemming fine fabrics. A longer four-thread stitch using three needles will hem a stretchy, durable seam on fabric for activewear and swimwear. T-shirts and knits will be better suited to a wide coverstitch, using three threads and two needles. It’s supplied with a blind-stitch foot, a gathering foot and a set of needles. There are thread nets, spool caps, and a spool mat, as well as a brush for cleaning and hexagonal wrench. The supplied soft cover keeps the machine free from dust. The manufacturer offers a 25-year limited warranty and technical support, via telephone or email, for the life of the product. A convenient manual is included to get you started. Easy to follow, color-coded threading system. The method advised by the manufacturer for removing stitched fabric from the machine can be challenging for beginners. Janome is one of the newer brands on the sewing machine market. They produce high quality, versatile machines for beginners and professionals. This coverstitch machine is no exception to the high standard of products they supply. The Cover Pro 1000CPX is a good machine, giving the home enthusiast access to industrial-style features. The machine measures 19.5 by 16.5 by 14.5 inches and weighs a sturdy 23 pounds. The machine holds four spools of thread and can stitch with one, two, or three needles. This lets you create a number of different seams and hems. There is a choice of a two-thread, chain stitch using one needle and a three-thread coverstitch using two needles. There is also a four-thread triple coverstitch using three needles. There is an easy reference sticker attached to the machine to help you decide which stitch to use for your garment. The machine has a differential feed with a ratio of 0.5 to 2.25. The stitches can also be adjusted for length and width. The length is adjustable between 0.03 and 0.11 inches (1-3mm). The width when using two needles can be adjusted between 0.11 and 0.23 inches (3-6mm). Using three needles allows you to create stitches up to 0.23 inches wide. The machine has a trademarked system for tightening seams and stitches at up to 1,000 stitches per minute. An extra feature on this machine is the size of the machine bed to the right of the needle. It measures 4 by 5.5 inches, which is the perfect size for larger items like quilts or coverstitching in the center of a garment. The machine is supplied with a bonus package including spare needles, a needle threader, and adjustable seam guide. There is a manufacturer’s limited warranty of 25 years on mechanical parts, two years on electrical parts and one year on labor. Three needles and four threads for many stitch options. Adjustable width and length of stitches. Free arm for cuffs, sleeves and more. Some experience an occasionally missed stitch. A coverstitch machine is essential for the sewist looking to achieve a professional finish. The CoverPro 1000CPX innovative design is based on the marriage of an industrial-style cover hem machine and a convenient home machine. 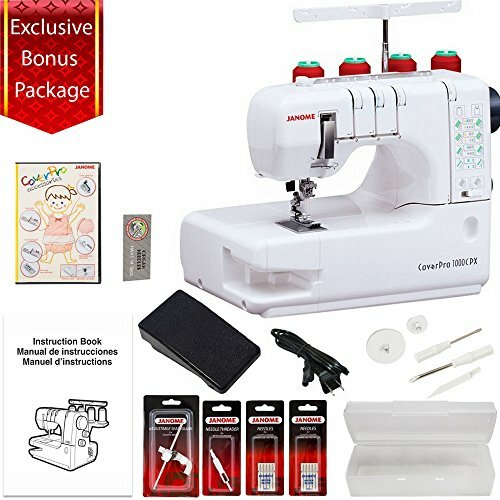 The CoverPro 900CPX from Janome is an excellent entry-level coverstitch machine. 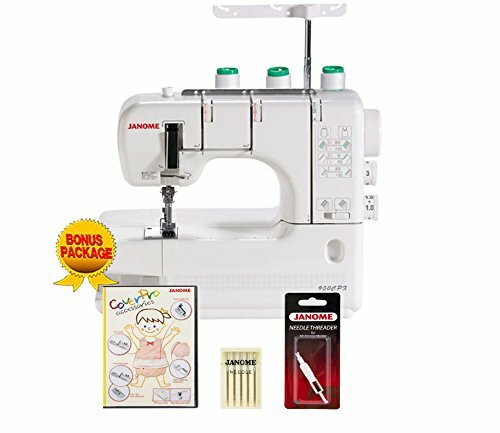 It has the quality and function expected from a name like Janome at a reasonable price. It is the older model of the Janome Coverpro 1000CPX. This machine measures 20.5 by 17 by 16 inches and weighs 27.4 pounds. It can stitch at up to 1,000 stitches per minute. This machine has three threads and two needles. This allows you to use a two-thread chain stitch using one needle or three-thread coverstitch using two needles. The differential feed has a ratio of 0.5 to 2.25. Both the length and width of the stitch can be adjusted. For length, this is between 0.03 and 0.15 inches (1-4mm). Width can be adjusted up to 0.19 inches (5mm). The 900CPX has a free arm for cuffs and sleeves. It also has an extra wide machine bed giving lots of room for larger garments. There is a seam tightening system, helping to reduce any slack in the looper thread when stitching. This results in strong flat stitches and a perfect hem or seam. It’s a breeze to thread and stitch choices are easy to make following the chart printed on the front of the machine. The pressure on the foot can be adjusted using a dial on the top of the machine. This Janome model comes supplied with a bonus package. This includes spare needles, a needle threader, and instructional DVD. Trademarked system for tightening seams. Sometimes skips a stitch when going over seams. Manual is not comprehensive, so online instructional videos might be needed. The Janome CoverPro 900CPX is a distinctive machine that is as powerful as it is useful. 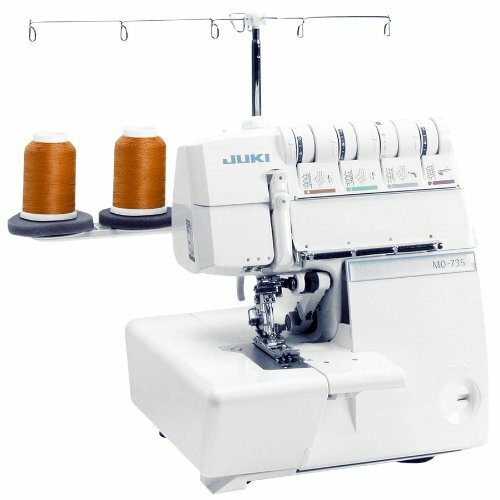 Juki is a Japanese company known worldwide for producing industrial and home sewing appliances. They have been trading since 1947, when they introduced their first sewing machine to the market. 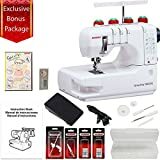 This coverstitch machine is priced higher than some of its rivals and would suit the professional seamstress (or seamster? Is that the male equivalent?). It is also perfect for a hobbyist if budget is no object. The MCS-1500 measures 15.5 by 13.5 by 14 inches and weighs 19.75 pounds. It has a maximum of 1,350 stitches per minute making it one of the quickest coverstitch machines we could find. This advanced machine is very easy to thread using the color-coded assistance printed on the appliance. The extension plate also has seam guidelines to help keep your stitching straight and exactly where you want it. The looper can be lowered at the press of a button to make threading even easier. The differential feed is adjustable for dealing with all types of fabric. The pressure on the presser foot can also be fine-tuned for the perfect seam, even on knits and stretch fabric. This is a three-needle machine which lets you create a three-thread coverstitch, perfect for necklines, sleeves, cuffs, and hems. It also creates a four-thread chain stitch which is strong and stretchy for side seams and waistbands. It is fitted with an exterior thread cutter which cuts the threads when you finish sewing—just by raising the pressure foot. The presser foot also lifts to about 0.4 inches (10mm) which is higher than many other machines. This makes sliding fabrics into a sewing position particularly easy. Juki offers a limited five-year warranty on mechanical parts and a two-year warranty on electrical components. There is also a 90-day warranty on defects in materials or workmanship. Color-coded diagram for easy threading. Seam guidelines for straight stitching. Some people experience tunneling on lightweight fabrics and knits. Can take some time to thread. 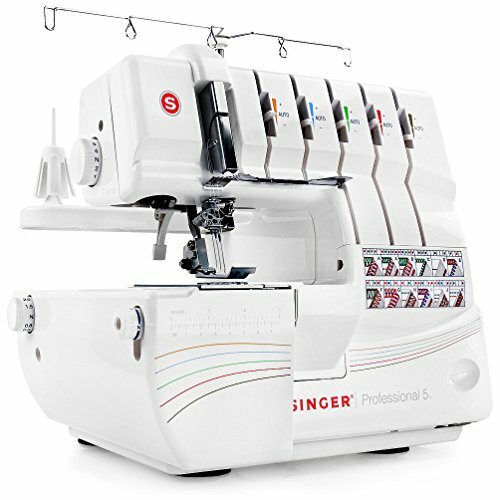 This coverstitch machine from Singer also works as a serger. Although it incorporates the functions of two machines in one unit, it is still reasonably priced. This machine sews three different types of coverstitch, including a wide two-needle coverstitch and a narrow two-needle coverstitch. It also sews a three-needle coverstitch. It creates hems on stretch fabrics and lets you decorate projects with a simple chain stitch. The machine measures 13.5 by 10.5 by 11 inches and weighs 23 pounds. The maximum stitch speed is 1,300 per minute, which can be adjusted using the foot control. It has a heavy-duty metal frame, ensuring stability during operation. The tension system is both fully automatic and self adjusting, which can accommodate different types of fabric. The stitch width and length can be adjusted via a dial located on the side of the machine. The machine has a differential feed to hold your fabric secure without stretching it. This machine also has a “2-3-4-5” thread capability for serging, this means you can use anywhere between two and five threads. It gives a wide selection of stitches for any project. The serger has the capability for four different rolled hems. This is an advantage when you want to hem a delicate fabric. The stitch finger is placed correctly for the rolled hem of your choice by the automatic access lever. There is a handy chart printed on the front of the machine, showing which threads you need for which stitch. These include chain stitches, flatlocking, and covered hems. The threading system is a lay-in type and is color coded for ease of threading. There is also a diagram to help you thread the machine. The Singer comes with an instructional booklet and CD, six presser feet, spare needles, tweezers, screwdrivers and more. The manufacturer offers a 25-year limited warranty. Coverstitching capability for two or three needles. Also operates as a serger. The manual can be hard to follow in places. You might need to look up YouTube videos for threading the machine. The Juki MO735 is another two-in-one machine. It’s a coverstitch machine and also a serger. 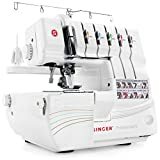 Priced at the higher end of the market, it is perfect if you are looking for a reliable serger and coverstitch combination machine. It will also save space, having both functions in one machine. This versatile machine measures 15.2 by 14.7 by 16.2 inches and weighs 23 pounds. It stitches at a maximum speed of 1,500 stitches per minute. It can create a four-thread coverstitch, three-thread coverstitch, and two-thread chain stitch. The machine needs to be threaded for the coverstitch mode. Combine this functionality with the extra high, presser foot lifter and it can deal with most types of fabric. This machine will coverstitch stretch fabrics like those used for fitness wear and swimming suits. It will also hem fabrics used in sweatshirts, fleeces, and T-shirts. It will create professional-looking hems on cuffs, sleeves, and necklines. It has a differential feed, which can be adjusted using a dial and the presser foot for coverstitching is supplied with the machine. The blade used for serging can easily be moved out of the way for threading and coverstitch. Threading the machine is easy using the color-coded diagram embossed on the machine. It has a safety switch which prevents the machine operating when opened for threading. As a serger, the machine has a “2-3-4-5” thread option, stitching with your choice of between two and five threads. It has adjustable stitch width and length. It can sew overlocked, flatlocked, rolled hem, super stretch, and safety seams. There is a built-in drawer for storing the needles, tweezers, and screwdriver that come supplied with the machine. When you register your purchase with Juki they offer a limited five-year warranty on mechanical parts. There is also a two-year warranty on electrical components and 90 days warranty on defects in workmanship and materials. This video briefly details some of the features of the MO735. Creates a two, three or four-stitch coverstitch. High presser foot lift to accommodate different fabrics. Can be used as a coverstitch machine and a serger. It can take about five minutes to change the threading configuration from coverstitch to serging function. If you make a lot of garments, a coverstitch machine will give you a professional, neat finish. It is especially good for any stretch materials and knits. Create your own swimwear, activewear, T-shirts and more. We have detailed our top six machines and there are even options which double as a serger for creating seams on clothes that will look like they just came from a boutique. Before you make your decision, bear in mind a coverstitch machine will only create hems. However, those hems will be stitched exceptionally well. Whether you make your own clothes or if you make garments for sale, a coverstitch machine can be invaluable. We are sure that, whichever one you choose, it will be a welcome addition to your sewing room.